ThermaSkirt EasyClean tackles spread of harmful infections in student accommodation - DiscreteHeat Co. Ltd.
“University undergraduate students are at higher risk compared with non-students of the same age group, especially those in universities with a high proportion of students in catered accommodation (4). The risk is highest among first year students who make up the majority of residents in catered accommodation, especially in the first term (HPA CDSC, unpublished data). Outbreaks in this group are well documented (5;6). A higher risk of meningococcal disease among first year students in dormitories has also been observed in the USA (7)”. The risk of bacterial meningitis is particularly high in university accommodation due to the close quarters the students live in. The World Health Organisation states that one of the causes related to the spread of meningitis is close or lengthy contact with someone who is carrying the illness; this is from anything to kissing, sneezing and coughing on somebody, sharing cutlery, glasses or kitchen utensils, or spending a lot of time with someone who is carrying the strain. With students living in such close quarters, it is clear to see why the spread is so common in university accommodation. Whilst students might sometimes struggle with personal hygiene, it’s the responsibility of the accommodation providers to ensure the apartments they provide are as safe and hygienic as possible. The installation of radiators in university accommodation pose serious hygiene risks in areas where students are living in such close quarters. Convection currents generated by radiators pick up harmful bacteria in the air and spread them throughout confined living quarters. Although bacterial meningitis cannot live long in the air, the confined living areas mean that students are more likely to breathe in airborne bacteria before it dies. With students having prolonged exposure to roommates who may cough or sneeze, the risk of its contraction greatly increases. Radiators also increase the risk of other harmful germs, spores and bacteria spreading in student accommodation. The fans and grilles on the top and backs of radiators are an ideal breeding ground for harmful spores and bacteria to accumulate before they are picked up and transported by the convection currents generated by the radiator. ThermaSkirt EasyClean completely eliminates this risk. 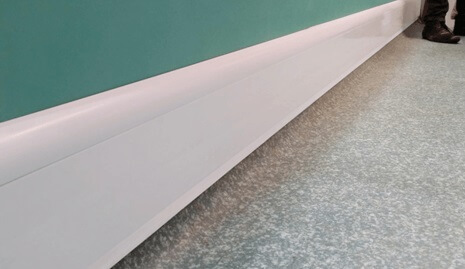 Developed in co-operation with the NHS Estates and Infection control departments, its radiant heating system ensures that there are no convection currents to pick up and transport airborne bacteria which may infect susceptible students with dangerous illnesses such as meningitis, C.Difficile and MRSA. Moreover, ThermaSkirt EasyClean is completely sealed with no fans or grills to harbour infection and, as the name suggests, all it needs is quick wipe down with antibacterial spray to ensure complete cleanliness. ThermaSkirt EasyClean is part of the NHS Procure 21+ scheme and has been specified in major NHS hospitals across the country, as well as countless care homes, schools and nurseries. 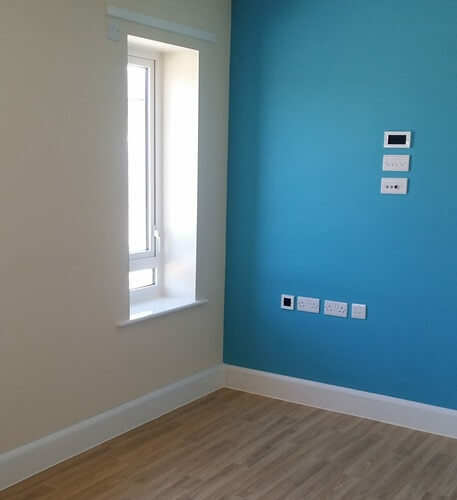 Notably, ThermaSkirt was installed in the Cripps Court accommodation development with Cambridge University who wanted a space saving, hygienic alternative to radiators in their student halls. Ensuring the health and safety of students is paramount in the development of university accommodation and ThermaSkirt EasyClean is leading the way in hygienic, efficient, affordable and safe heating for universities across the country. Fill in the form here for a free callback, or phone us on 01942 88 00 66 for more information or a no obligation quote.